We Buy Houses Delaware - Opp Real Estate-Call Now! We Buy Houses in Delaware! We Buy Houses in Delaware. We can close in as little as two weeks. Need to Sell Your House Fast in Delaware? If you need to sell your house fast in Delaware and the surrounding areas…we’d like to make you an all cash offer. We purchase properties anywhere in New Castle County. If you need own a property in Wilmington, Newark, Bear, New Castle, Hockessin, Claymont, or anywhere else in the county, we want to buy it! We buy houses in Delaware in any condition… as-is… with all cash! We can close in as little as two weeks! It can all add stress, months to the process, and in the end after paying for property maintenance, seller concessions, closing costs, and agent fees, you may or may not make as much as you thought. That is why we buy houses Delaware. Get Cash Now and Stay In Your House! 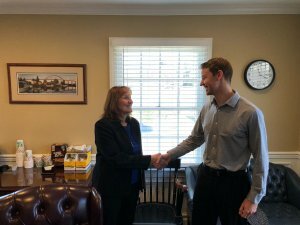 Since we buy houses in Delaware, we want to provide you with the BEST value that we can, and because of this, we can offer you options that a realtor or our competition can’t come close to matching. We will give you cash for your house, and even let you stay in the property while you find another house to live in! That’s right! You can live in the very same property as you currently do, after we give you tons of cash, while you are searching for another place to live into. We can even find another property for you!!! We are here to bring you the BEST value and to serve you as best as we can. Another satisfied house seller! At settlement with Cathy on her Newark property. 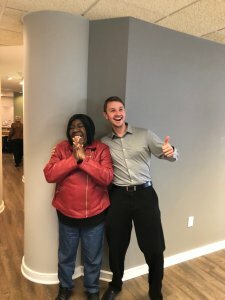 We closed it in less than a month! We help homeowners just like you. Whether it’s a divorce, foreclosure, death of a family member, burdensome rental property, or a property on the verge of collapsing, we are here and we are ready. We buy houses in Delaware and the surrounding areas. Sometimes, those who own property simply are too busy to take the time to make repairs, negotiate, show and stage the property, communicate and every other thing needed to be done to a house to sell on the market… Let alone selling your house fast for cash! If you would like more information, fill out the form above or give us a call. There is no obligation and we will never share, rent, or trade your information with anyone. We look forward to working with you!